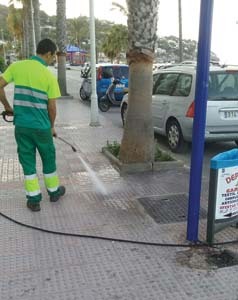 Almuñécar’s Contracting Committee has signed a contract with the refuse-disposal/street-cleaning company, FFC worth 51-million euros over ten years. From now on, this company will be in charge of keeping the town’s beaches and streets clean and rubbish collected on a daily basis. According to the Councillor for the Environment, Luis Aragón, a lot of work went into the contract conditions, fruit of many months of intense preparation. However, although the FFC placed the winning bid and a contract has been signed between the Mesa de Contratación and the cleaning company, the deal still has to be approved in a Plenary Meeting. This, however, shouldn’t be a problem as the governing coalition holds a majority. When this contract does go through, it will be for the largest amount ever signed by the Town Hall. The councillor considers that the deal will represent a big jump in service quality, amongst other reasons, because of a staff increase from 80 to 88 workers, as well the purchase of new machines and vehicles. However, the opposition parties are not happy bunnies, who have been very vocal in their criticism, especially Juan Carlos Benavides’ party, from the CA. This criticism centres around the fact that the governing coalition opted for the most expensive bid put forward; i.e., that put forward by FCC, which already holds the municipal-cleaning contract under inferior terms and conditions. This entry was posted on Monday, February 11th, 2019 at 8:54 am	and is filed under Almuñécar. You can follow any responses to this entry through the RSS 2.0 feed.